A husband and wife in their 30s decide to quit their jobs, live as free spirits and cruise America in a Winnebago. Albert Brooks first made a name for himself via short movies he directed for the �classic� run of Saturday Night Live in the 1970s, and he eventually got a shot at big-screen filmmaking. 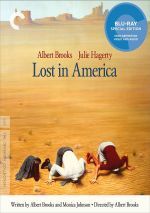 His third directorial effort, 1985�s Lost in America offers Brooks� take on the �road picture�. David (Brooks) and Linda Howard (Julie Hagerty) live an upwardly-mobile lifestyle in LA, but their circumstance changes when David runs into trouble at work. After he fails to land an expected promotion, he insults his boss and gets fired. Rather than seek new employment, David gets Linda to quit her job so they can embark on an adventure. They buy an RV and hit the road in an attempt to see the country and live the good life. Matters develop in less than optimal ways. Though I knew his work on SNL and was aware of his first two feature films � 1979�s Real Life and 1981�s Modern Romance - I�m pretty sure Lost was the first Brooks movie I actually saw. I was just a little too young for his material prior to 1985, but at the age of 18, I seemed �ready� to partake in his talents. Or so I thought. As I recall, Lost didn�t make much of a dent, as I felt it offered mild amusement and not much more. Given my age, it seemed possible that I was too young to fully appreciate Brooks� style. While he may now be most famous as the voice of a cartoon fish, Brooks� self-directed work went down a path clearly oriented toward a more �adult� crowd, so I thought I might �get� Brooks better at 49 than I did at 18. On the surface, Lost sounds like a cross between Easy Rider and National Lampoon�s Vacation. That said, one shouldn�t expect a broad, engaging trek across America, as David and Linda�s fortunes take a turn for the worse that causes them to stall before they get too far. That becomes part of the joke, as the �road trip movie� does little to send its leads on a long drive. In 1985, this choice disappointed me, probably because I suspect I did essentially expect Brooks� take on Vacation. I wanted David and Linda to visit colorful locations and experience wacky adventures. Brooks refuses to give us that version of the story, as he goes for a darker view. While Linda and David profess to want to �find themselves�, consumerism trips them up and destroys their journey before it really starts. Rather than focus on those �road trip� moments I anticipated, Lost becomes much more of a character study, though I don�t want to overstate this side of the film. Too much analysis might leave the impression that Brooks creates a low-key, heavily introspective film. While Lost may lack the broad wackiness of Vacation, it remains a comedy, and a good one, mainly via the strength of Brooks� personality. Though supporting characters occasionally get their time in the sun, the film focuses on its leads to the exclusion of most everything else, and it puts Brooks in the literal and figurative driver�s seat the majority of the time. Not that Hagerty doesn�t get some moments of her own. Linda�s biggest scene comes when she finds herself addicted to gambling, and Hagerty acts out the character�s obsession in a delightful manner that seems both cartoony and honest at the same time. Other than that one sequence, though, Hagerty takes an obvious backseat and doesn�t enjoy much time in the spotlight. While Linda acts as an important aspect of the story, the character doesn�t find many memorable moments. Instead, Brooks gets the lion�s share of the comedy. This feels a little egotistical and unfair, as I�d prefer that Brooks had spread the wealth, but he does so well in the part that I can�t complain. I�m not sure I�d call Lost a comedic tour de force for its auteur and guiding light, but it does allow Brooks to put his talents on full display. He manages to take small moments and wring the humor from them, and he plays the role with just enough bluster to succeed. Make no mistake: Brooks� David doesn�t come across as a truly natural personality. However, he doesn�t turn into a cartoon either, as Brooks manages to walk the line between these concepts. He adds plenty of laughs and really carries the movie. Lost in America lacks immense ambition, and it seems to abandon most of its metaphors and meaning as it goes. Still, the movie offers plenty of entertainment value and holds up well after more than 30 years. Lost in America appears in an aspect ratio of approximately 1.85:1 on this Blu-ray Disc. Though it reflected its age and era, the image looked pretty good. Overall sharpness seemed positive. Some interiors appeared a little soft, but in general, the movie offered fairly solid delineation. I saw no jaggies or moir� effects, and both edge haloes and print flaws remained absent. Lost went with a low-key palette that favored a brown tone. These hues remained acceptable � they didn�t show great range but they suited the material. Blacks were fairly deep and dense, while low-light shots displayed adequate clarity, though they could be a bit thick at times. All in all, the image appeared to accurately reflect the source, bland as that might be. Nothing memorable came from the PCM monaural soundtrack of Lost in America. Speech was the best aspect of the track, as the lines appeared concise and fairly natural. Effects had little to do in this chatty movie, but they showed acceptable accuracy. Though it didn�t burst out of the speakers, music offered reasonable range and clarity. This ended up as a decent but unmemorable soundtrack. How did the Blu-ray compare to the DVD version? Audio showed a little more heft, and visuals seemed cleaner, tighter and smoother. 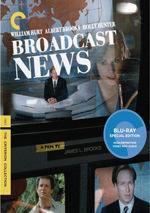 Even with the source�s limitations, the Blu-ray offered a superior presentation. In addition to the film�s trailer - which also appeared on the DVD � we get four new interviews. For the first, filmmaker Robert Weide chats with writer/director/actor Albert Brooks. During this 30-minute, five-second piece, Brooks discusses the cinematic �Albert Brooks character�, his history in show business, and aspects of Lost in America. It�s too bad Brooks didn�t record as full commentary, but he compensates here with plenty of useful details. Next comes an 11-minute, 14-second interview with actor Julie Hagerty. She chats about her experiences on Lost as well as other aspects of her career. Hagerty brings us a nice collection of memories in this engaging piece. An interview with Albert Brooks� long-time manager Herb Nanas goes for 11 minutes, 51 seconds. Nanas goes over his work as a manager, with an emphasis on his time with Brooks. This turns into another useful program. Finally, we get a 14-minute, 33-second interview with filmmaker James L. Brooks. He tells us about his relationship with Brooks and their collaborations. Brooks throws out a mix of solid thoughts. The set concludes with a 12-page booklet. It includes photos, credits and an essay from critic Scott Tobias. As usual, the booklet winds up the package well. Nothing particularly profound comes from Lost in America, but it manages to entertain. Albert Brooks uses the film as a springboard for his talents and gives the movie a lot of comedic energy. The Blu-ray offers dated but pleasing picture and audio along with a decent array of supplements. America holds up well after more than 30 years.